So I tried drafting SOI for the first time on Friday. I had not drafted since an RTR draft way back in December so I was seriously out of practice. I ended up with a fairly average deck that won over inexperienced players, but couldn’t beat a particular bomb mythic. I tried to draft RB Madness (no vampires, because those are a luxury not easily accessible when 4 of the 8 drafters are in Red). What I ended up with is this very deck that simply races the opponent. You probably noticed the strange inclusion of white. I forced it in order to splash for Gryff’s Boon and Tenacity. Boon proved itself worth it, though I never resolved Tenacity. I took a Thing in the Ice pack 2 over cards more useful for my deck. That being said it made the night more useful in the long run (by actually getting a useful card for the future). My opponent ran as many equipment as he could get his hands on. His Militant Inquisitor was a potent threat while boosted due to them. I ended up losing Game 1 after gambling on a Malevolent Whispers to take him down to 3 life, but I didn’t draw into anyway to pump my Crow of Tidings for game (over the course of 3 turns…). Game 2 my opponent main phase cast an Archangel Avacyn. I misplayed by attacking him, allowing it to flip and wipe the board. I didn’t draw into a way to out Avacyn, so it beat me easily. My opponent had multiple copies of Aim High in his deck. Once I got into the habit of playing around it his deck pretty much fell through. I did resolve Gryff’s Boon multiple times to win game 1 though. Giving an Accursed Witch flying forced out his Aim High and in turn got me the Infectious Curse as a life buffer. I got color screwed after a mulligan to 6 game 1. I had 4 black cards in hand and ultimately had to use Warped Landscape to find my first swamp on turn 5. All the white an army of small creatures beat me to 2 life making a comeback impossible. Now game 2 and 3 my opponent demonstrated a strange proclivity toward never cracking his clue tokens. I outraced him game 2. While in game 3 he got mana-flooded and still didn’t use his clue until it was just too late. It was only a three round tournament so that was it. I was too hard on myself for a 2-1 record after the draft. For my first one in months I think I did pretty decent. Shadows is a very fun set to draft though I have to say. The synergies in the set are (in my opinion) very satisfying to utilize. Every time I resolved Madness I felt very happy with myself. It was a lot of fun, but also pretty stressful. I’m probably going to wait until Eternal Masters for my next draft excursion. Anyways, thanks for reading as usual. The yugioh cards pictured are from some Millennium Packs I bought on a whim before the draft. This set has next to no monetary value, but I like the alternate art cards so it was not a total waste. 4 Reasons Why Magic the Gathering Modern is just Yugioh, Why I’m quitting and so should you! As the regrettably click-bait name implies, yes I am effectively quitting Modern and yes after many years of following the format over YouTube, Twitch and at regional events I’m 100% certain that the Modern Format is synonymous to the game of Yugioh. I hope my hastily prepared evidence is enough to make you consider my argument. Using this logic I’m going to try to justify selling out of Modern (since I did the same with Yugioh). Anyway, let’s get this travesty that I’m using to justify selling cards I worked very hard to get. Modern is a format where kills by the 4th turn of the game are not only allowed, but seen as fair. As long as no deck can achieve a consistent kill before turn 4 its deemed safe for Modern. That being said certain decks like Goryo’s Vengeance, Storm or Infect can still win on the 2nd or 3rd turn of the game, just not very often. In Yugioh, the game has recently gotten so fast that certain decks win on their first turn going second. Mermail decks for example have an easy OTK combo by combining Neptabyss, the Atlantean Prince with Instant Fusion. Similar results can be seen with the Kozmo deck that OTKs by using Kozmo Dark Destroyer to destroy itself to allow for extra attacks by floating into smaller Kozmo monsters. Modern is an expensive format. Most of cards needed to build each archetype are very expensive. Similarly Ygo has expensive staples each format, the difference being that Yugioh’s ban list combined with its amazing power creep causes the price of each staple to eventually drop once they’re no longer relevant to the format. Tarmogoyf is a Modern Staple for Jund/Abzan decks (To be fair, this card also sees play in Legacy and Vintage). This card has seldom cost less than $100 per copy despite multiple reprints. Kozmo Dark Destroyer is a staple for the Kozmo deck. This card reached a height of $140 per copy before a recent reprint demolished its price. Whenever a new archetype or combo piece appears in Modern, it can cause older magic cards to spike in price. This same process occurs in Yugioh when an old card suddenly sees play in the current format, usually in a new deck. This card is seeing play in a new list for Jeskai Control. As a result it’s price has greatly risen. Here’s a card that was released in May 2015 in the Crossed Souls set. On release it was worth a few quarters, but today it’s risen to almost $15 thanks to the recent Blue Eyes White Dragon support. There is no greater relationship between Yugioh and Modern than the presence of the ban list. Now the uses of the ban hammer in both of these games are very different. In Yugioh the ban list is merely a tool to ensure that the older decks cannot fight the newest archetypes that they want to sell. In Magic however, the goal is to keep the Modern format balanced (or as aforementioned to prevent turn 1-3 kills). However, the effect of the ban list is that while the game improves people lose their decks and their investments. I’ve watched close friends lose a great deal of money as a result of the Splinter Twin ban and the Adjusted Ban List to name only a few recent events. Obviously, it’s for the greater good to shake up the format, but people get hurt along the way regardless. Splinter Twin after being reprinted in MM2, and then subsequently banned in Modern has dropped to about $5 from it’s height of $25. The Pre-release hype card Performapal Pendulum Sorcerer was $99 during the BOSH sneak peek and remained at $60 until the Adjusted Ban List hit. As a result it’s price dropped to about $30, and now is $18 after an an all time low of $15. I love watching Modern matches and the format overall. There always an interesting race and the format is so diverse that there’s usually a cool match-up to watch on YouTube. While many would take from this article that my comparison between Modern and Yugioh is a negative thing, I don’t mean it to be. I personally love watching both formats. The key difference is that I play Yugioh weekly, while I haven’t actually played Modern in almost 5 months. When my friend who played Splinter Twin lost his deck (and also moved away) I had no one to play with. I didn’t think my Elves deck was strong enough to fight my local stores meta and I had absolutely no plans to play while Eldrazi dominated the format early this year. Now I’m at the point where my modern deck has wasted away in a deckbox on my floor. I personally believe that if I’m not using a card I should ensure someone who will use it receives it. Furthermore, Modern just feels like Yugioh to me. It’s not about cool brews and innovation as much as the same tested consistent decks being used over and over again. Yes there’s an aforementioned diversity in the format, but there’s also a clear tier level. Yugioh is the same way wherein you either play the meta or desperately struggle running a rogue deck. Elves isn’t exactly a meta modern deck. It’s a strategy that resonated with my early days of playing mono green ramp after cracking a 2013 Intro pack. Sadly those days have long past and it’s time to get out once and for all for the safety of EDH (the only magic format I can rely on). Using these likely hard to move Japanese copies of Ezuri and Heritage Druid I’m going to build Ezuri EDH (or Tiny Leaders). This way I can keep the spirit of my elves deck in a format where I’m likely to actually play it. It also lets me keep the Pendelhaven and Okina that were the gifts from my friend who used to play Twin. This decision actually hurt me more than quitting Standard and quitting competitive Yugioh since this deck cost me almost as much as Nekroz did to build. What I do know is that I still play my Nekroz deck whenever I get the chance even at the risk of easy losses to the meta, whereas I never even bring my Modern deck when I head to Magic events. Anyway I’m on the verge of rambling now so it’s time to stop. I hope you found this list of comparisons if not convincing, at the very least interesting. I went to the Shining Victories Sneak Peek yesterday as the massively time-consuming study break. As it’s currently 4 AM , I’m just going to upload some pictures and briefly give the highlights of the day. Our 5 person party got to the Alternate Universes location at 1 pm nearing the store’s inevitable running out of sealed product. We all got 2 bundles of packs. My most relevant pull was a Blue Eyes Spirit Dragon which I traded for the Nekroz of Trishula and Tezzeret (because I saw a lone mtg card in a ygo binder and got very excited). The day then became a grind of asking everyone in the store for Lunalight Panther Dancer as only 6 were opened in the store, but 5+ people (3 members of my own group included) wanted to build the deck. I got all of the pieces for a Digital Bug deck in under 10 minutes, the only card I had to trade for being the Rhinocerus Xyz. I never found a Panther Dancer, but I got the rest of the deck (as did one of my comrades who did manage to get a single Panther). A $1 binder was found at the store. Much of these random cards are from that binder, because $1 binders are love, $1 binders are life. 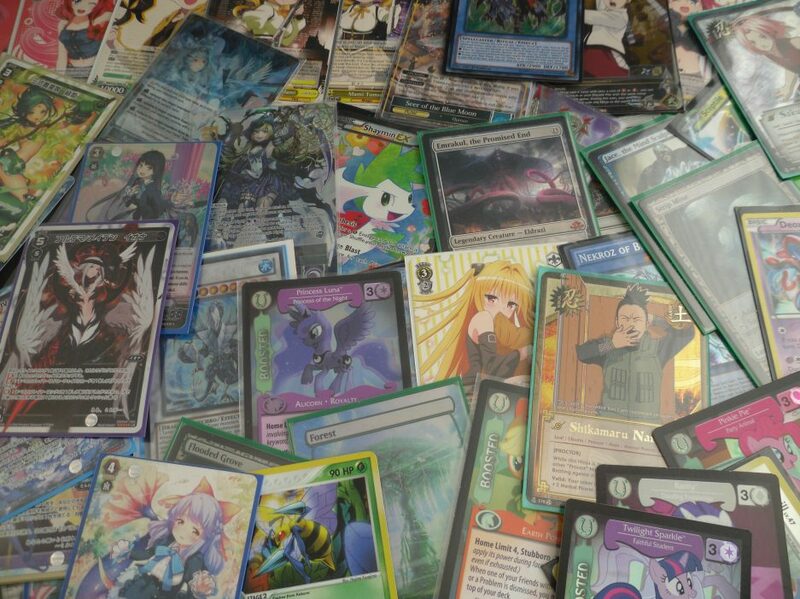 Someone sold me the FoW and Pkm cards too (happiness over getting almost all the card games! That I play anyway hehe). The sneak peek was a blast and I’d go again if able. Truth be told it was just opening new cards and trading with up-charging strangers and shady types, but the results made it all worth.